Put an ancient ghost to rest. Sleep at the Old Hroldan Inn. Speak to the ghost that appears. Go to the random dungeon and recover Hjalti's Sword. Return the sword to the ghost for free training in One-handed and Block. "Hjalti was a shrewd tactician, and his small band of Colovian troops and Nord berserkers broke the Reachman line, forcing them back beyond the gates of Old Hrol'dan. A siege seemed impossible, as Hjalti could expect no reinforcements from Falkreath." 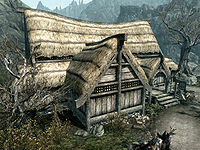 Old Hroldan Inn, the remote inn along the shores of Karth River in the Reach, holds an important place in history, at least according to innkeeper, Eydis. As soon as you enter the taproom she will claim, "Old Hroldan is the stone that the Empire's history is built on" and will then ask if you want to rent Tiber Septim's bed. When asked to elaborate Eydis will provide a lengthy description on the historical importance of Old Hroldan. She will explain the location marks Tiber Septim's first victorious battle when he liberated the area from barbarians during the Second Era. According to history, the victorious general then spent the night at the inn and his bed is still there, as good as new. Eydis charges a meager ten gold for renting out the venerable bed, so accept the offer and follow her to the room. Note the skill book The Battle of Sancre Tor on the nightstand, then go to bed. "Hjalti? Is that you? I've been waiting." "I fought by your side. To take back the Reach from the savages." "Do you remember me now, Hjalti?" When asked about why he is referring to you as 'Hjalti' he will remind you that the two of you fought together to free Hroldan, and that you promised to be his sworn brother. He then explains that he has waited an eternity for the sword that will fulfill the promise, but will not reveal anything else. If asked further, Eydis will speculate on the name 'Hjalti' and guess that it was one of the many names of Tiber Septim. 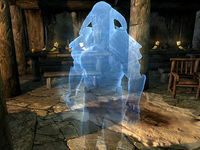 She suggests that the ghost is one of Tiber Septim's dead soldiers. Luckily, Eydis' map marker will show you all the way to the boss-leveled chest in the depths of the random location. Once you have Hjalti's Sword return to Old Hroldan Inn and present the sword to the ghost. He will be most honored to become your 'sworn brother' after hundreds of years and reward you with a few lessons from the sword masters of Alcaire: a one-point bonus to your One-handed and Block skills. He will then disappear into thin air, confident that you travel along with him. "That night a storm came and visited Hjalti's camp. It spoke with him in his tent. At dawn, Hjalti went up to the gates, and the storm followed just above his head. Arrows could not penetrate the winds around him. He shouted down the walls of Old Hrol'dan, and his men poured in. After their victory, the Nords called Hjalti Talos, or Stormcrown." It is possible to acquire Hjalti's Sword in one of the potential spawn zones even before sleeping at Old Hroldan and starting the quest. The sword is flagged as a quest item until it is turned in. For more information about Hjalti and the Battle of Old Hrol'dan, see The Arcturian Heresy. The following empty quest stages were omitted from the table: 5, 10, 15, 100. On the PC, it is possible to use the console to advance through the quest by entering setstage FreeformOldHroldanB stage, where stage is the number of the stage you wish to complete. It is not possible to un-complete (i.e. go back) quest stages, but it is possible to clear all stages of the quest using resetquest FreeformOldHroldanB.